In accordance with obligations under Accessibility Standards for Customer Service, Ontario Regulation 429/07 under the Accessibility for Ontarians with Disabilities Act, 2005, Janzen’s Pharmacy has developed this accessibility policy. This policy will be reviewed and updated annually or when substantive changes are required. Janzen’s Pharmacy is dedicated to providing accessible and equitable customer service to our diverse and valued customers in a manner that takes into account the dignity and independence of all people; including those that are differently albed. Janzen’s Pharmacy Accessibility Standard for Ontarians with Disabilities – Customer Service Policy has been developed to ensure a consistent consumer experience is provided in Janzen’s Pharmacies located in Thunder Bay. These policies and procedures are consistent with the core principles of dignity, independence, integration and equality. This policy applies to all employees and volunteers, as well as anyone dealing with the public or other third parties on behalf of any Janzen’s Pharmacy in Thunder Bay. The provision of services to persons with disabilities will be integrated whenever possible, unless an alternate measure is necessary to enable a person with a disability to access services. People with disabilities will be given an opportunity equal to that given to others, to obtain, use or benefit from our services. Janzen’s Pharmacy is committed to communicate with persons with disabilities in a respectful manner that takes into account their disability. A person with a disability may contact Janzen’s in person, by phone or fax or email to request a specific communication plan and/or documents in an alternative format appropriate for their needs. Janzen’s Pharmacy encourages people with disabilities to use their personal assistive devices to access our merchandise and services. To further ensure the accessibility of our merchandise and services, staff are available to assist with in store navigation and all of our Janzen Pharmacy locations provide home delivery. Janzen’s Pharmacy is committed to providing services to a person with a disability who is accompanied by a support person. It is necessary to seek consent of the customer before discussing confidential personal health information in the presence of the support person. If the required support person is required to wait in a separate area while a customer’s confidential matters are addressed, accommodations will be made to support the customer in the absence of the support person. Service animals are welcome to accompany individuals with disabilities in those areas of premises that are open to the public or other third parties, except where prohibited by law. If the situation arises whereby a service animal or guide dog is prohibited by law from the premises, Janzen’s Pharmacy will provide personal assistance during the customers visit. The individual with a disability is responsible for the care and supervision of their service animal while on any Janzen Pharmacy premises. If the animal poses a risk to safety, and needs to leave the premises, Janzen’s Pharmacy will work with the individual with a disability to assist in providing services in an alternate manner. In the event of a planned or unexpected interruption of service, Janzen’s Pharmacy will notify the public. The notice will include information about the reason for the interruption, anticipated length of time and a description of alternate locations or services, if available. Notice will be posted at main public entrances and on the Janzen’s website at www.janzens.ca and via social media. Janzen’s Pharmacy will provide training about accessible services to employees, volunteers and anyone who deals with the public or other third parties on behalf of Janzen’s Pharmacy. How to interact with people with disabilities who use an assistive device, service animal or a support person. How to use any assistive devices available at Janzen’s Pharmacy or that we otherwise may provide that may help with the provision of goods or services to people with disabilities. What to do if a person with a particular type of disability is having difficulty accessing our goods or services. Janzen’s Pharmacy customer service policies, best practices and procedures in providing goods and services to people with disabilities. Training records will be kept by Janzen’s Pharmacy Human Resource Department. 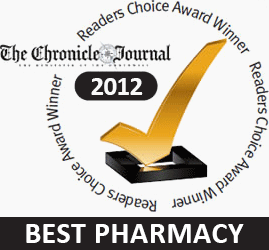 Janzen Pharmacy will make every effort to ensure that individuals are able to participate in our feedback process. Feedback may be received in person, by telephone or fax, in writing by online submission to feedback@janzens.ca or by another method determined by both parties. For individuals who have left contact information and/or if contact has been requested a Human Resources designate will respond to the request within 10 business days. The Human Resources Department will document and track all correspondence. We are pleased to provide a copy of this document upon request, in a format that takes into account the person’s disability. Accessibility is about removing barriers, not a person’s disability. Feedback policy and process developed for public to contact Janzen’s Pharmacy. All unexpected disruptions of core services will be posted as soon as possible on our website's home page and social media pages; along with in store postings. Planned service outages will also be recorded on our on-hold messages for all pharmacy locations and faxed to appropriate community agencies. The AODA is the afterward legislation of the Ontarians with Disabilities ACT (ODA), 2001. The ODA Act received Royal Assent on 14 December 2001 and came into force on February 7, 2002. The obligations under the ODA remain in effect as accessibility standards are developed under the AODA. For more information please visit the Ontarians with Disabilities Act Committee’s website. The AODA does not supersede the Ontario Human Rights Code and if two laws conflict with one another, Section 38 of the AODA states that the law that provides the higher level of accessibility is the law that must be followed. Persons with disabilities who encounter barriers to services, facilities, housing or employment will continue to be able to file complaints under the OHRC, and the OHRC remains the key enforcement mechanism for individuals with disabilities. For more information please visit the Ontario Human Rights Commission’s website. The principle of the Canadian Human Rights Act is that “all individuals should have an opportunity equal with other individuals to make for themselves the lives that they are able and wish to have and to have their needs accommodated, consistent with their duties and obligations as members of society, without being hindered in or prevented from doing so by discriminatory practices “. The Ontario Human Rights Code requires organizations to accommodate people with disabilities to the point of undue hardship. For more information please visit the Canadian Human Rights Commission’s website.